In this post we are diving into Clean Beauty Products! We’re talking about why you should make the switch and how to do it without getting overwhelmed. 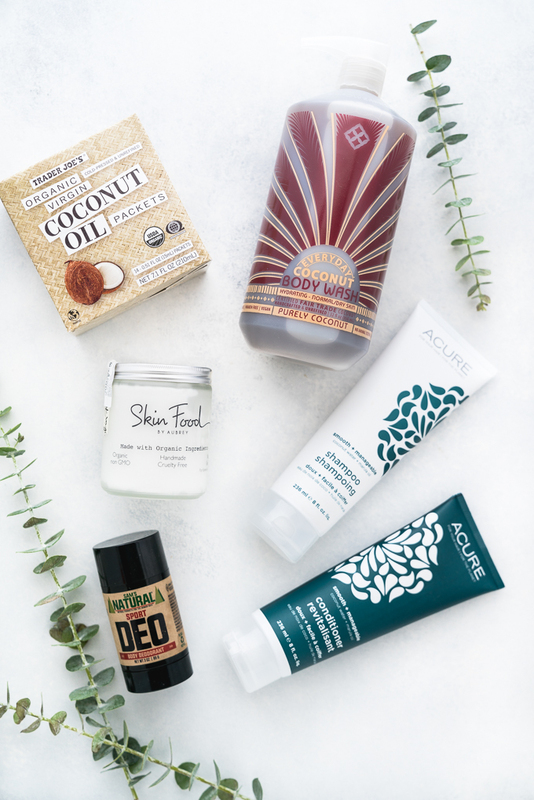 Plus there’s resources included for where to find the best natural beauty products – including organic skincare, all natural bath & body products, aluminum-free deodorant, and non toxic make up. As a healthy-food & healthy lifestyle blogger, I like knowing that what I’m putting on my body is just as safe as what I’m putting in it. So I take the same care in choosing face and body products as I would in choosing food for my recipes. I imagine that you’re the same way – the kind of person who is always looking for ways to live a healthier and happier life! A few years ago, I made the decision to transition the beauty products I use most often (shampoo, conditioner, face wash, soap, lotion, deodorant, make up, etc.) over to products with better quality ingredients. Aiming to swap my tried-n-true products for ones that are ethically sourced and don’t contain any concerning chemicals (like parabens, sulfates, synthetic fragrances, phthalates, harmful surfactants, and more). And let me tell you, trying to do it on my own was pretty overwhelming. It felt like a LOT of changes to make and I had no clue where to start. So I’m super excited to share this guide to help you get started (or help you clean-beauty-crusaders continue even further along in your journey). If you’ve been looking to make the switch or have ever been curious about what’s really in the products you use every day – then this guide is for you! Why Choosing Non Toxic Beauty Products Matters. Your skin is your biggest organ and your first line of defense against the outside world (germs, toxins, papercuts, etc.). And some of what you put onto your skin gets absorbed into your body and even your bloodstream. That’s why topically administered products like nicotine or birth control patches are able to deliver effective doses of substances without needing to inject or ingest them. But perhaps the most compelling reason of all for why you should be looking at the ingredients in your bath and beauty products is this – the FDA only lightly regulates the cosmetic industry. It simply doesn’t have the authority to govern the cosmetics industry that we would need to ensure that products are tested for safety before hitting the shelves. Full disclosure of all ingredients on product labels is not required. Current regulations also fail to keep harmful chemicals (including known carcinogens) out of these everyday products. For comparison of how other countries are choosing to regulate their cosmetics industries, the European Union has banned 1328 harmful chemicals but the US has only banned 30 of them. While other countries have taken a proactive stance (banning or restricting the use of specific chemicals at first indication of their potential harm), the US is in a position of adding chemicals only after they have been proven (with data from long-term studies and thorough well-funded research) to be harmful. Which puts consumers in an uncomfortable position – take a chance on something banned across the globe or take our own proactive measures? Looking closely at your beauty products is even more important considering the recent rise in “greenwashing” practices. Greenwashing refers to the practices of companies who advertise themselves or their products as environmentally friendly when they are not. This can manifest itself as labels claiming a product is “natural”, “clean”, “healthy”, or “pure”. Or perhaps a PR campaign showcasing a company-wide recycling program or how much money they donate to environmental protection projects. Or it could be as simple as changing the look of the packaging itself (i.e. logos with leaves & flowers or products featuring words like “green”, “earth”, or “eco” in their names). Unfortunately, while the brands are indeed recognizing the consumer-preference for cleaner products…their ingredients and formulations don’t always match up to these claims. For some “green” products, you can flip over the packaging and still find chemical preservatives or carcinogens lurking in the ingredients list. The process of switching over old formulations to new ones isn’t always simple. It requires an investment in money and research, which some companies aren’t willing to make. And with no restrictions on the books for what they can and cannot do, or how to regulate the language being used to sell these products – what incentive is there really for them to spend time and money on changing now? Especially when all they have to do to increase sales and boost public perception is change the packaging the product comes in. Much simpler and much more cost effective. Okay. So the FDA isn’t doing the dirty work for us…and it doesn’t show any signs of changing those regulations in a meaningful way any time soon. And, yes, a lot of brands out there that claim to be clean, may or may not actually be delivering on their pretty packaging’s promises. But don’t fret, my friend – there’s still plenty of things we CAN do. First, we can “vote” with our wallets for what kind of change we’d like the beauty industry to take on. Showing them that there is a lot more buying-power behind products that abide by stricter standards and have our best interests at heart. AND second (and perhaps the most impactful), is that we can empower ourselves to make better decisions by getting educated on what’s in our products. In the absence of a watchdog keeping an eye out for us, we have to do our own homework. It’s just a matter of acquiring the information we need to make the best possible choices for ourselves and our loved ones. Lucky for us, much of that information is available for free right here on the internet. Usually only a quick google search or two away. And I’m going to point you in the direction of some great resources that will help you find out everything you want to know (and then some). Knowledge really is power, and that’s why I’ve poured so much time and information into this post to make sure you have as much as you need to make the changes you want to see. 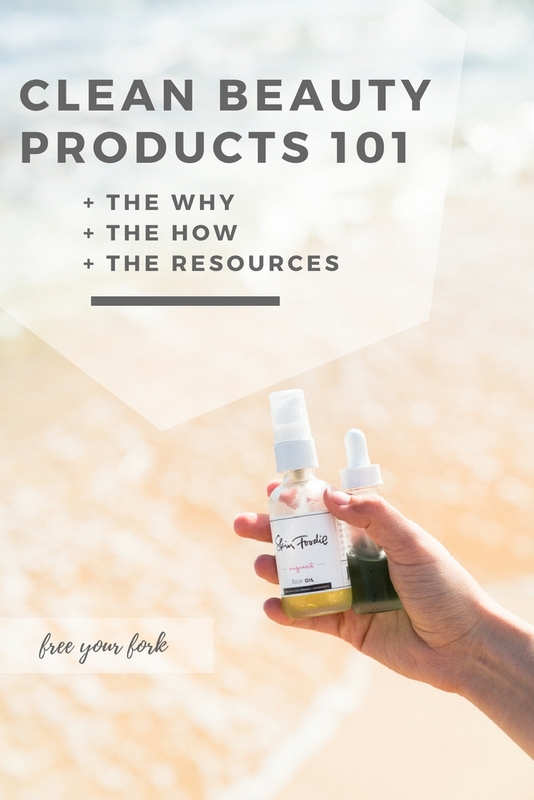 If you want to make some changes or are just curious about the ingredients in your current products, you can use these resources to find out more. These sites will help you discover which brands out there are in line with your own philosophy about what should and should not be in your beauty products. Ones that are taking measures to provide safer products by using the EU list of banned ingredients as a guideline – proactively self-regulating their product formulations and offering a stronger commitment to ingredient transparency. Each of these sites offers an abundance of information. They offer detailed and easy to understand knowledge about commonly used ingredients – like which chemicals to avoid and lists of cleaner brands & products to choose from. The one that I find myself using the most is the EWG Skin Deep Database. It’s easy to search for your exact beauty products, look up specific ingredients or chemicals by name, and even get a quick summary snapshot of how clean certain brands are or are not. They even have an app so you can check products as you shop for them in the store. If you’ve never used their database before, they have a super helpful user’s guide that explains how to make the most of the site. The EWG database uses an easy-to-understand rating system (on a scale from 1 to 10, with 1 being the cleanest and 10 having the most cause for concern). It’s even color-coded so you can see right away if it’s in the green-zone (good), yellow-zone (some concerning ingredients), or red-zone (high-amount of concerning ingredients). They also provide ratings for data availability (like how many scientific studies have been conducted and how much info is available in their database) so you can know how well-researched an ingredient is. In an ideal world, you’d choose something that not only has a low hazard rating but also has a high amount of information available to support that rating. To date, the EWG database contains information on 73,723 products and 2,138 brands. And a massive database of individual ingredients and details on why each of those has been flagged for concern. If for some reason your exact product or brand is not contained within their database (which does happen from time to time) they have a feature called “Build Your Own Report”. You can copy the ingredients list straight into the report generator, get an estimated score, and get an idea of how good of a fit that product would be for you. 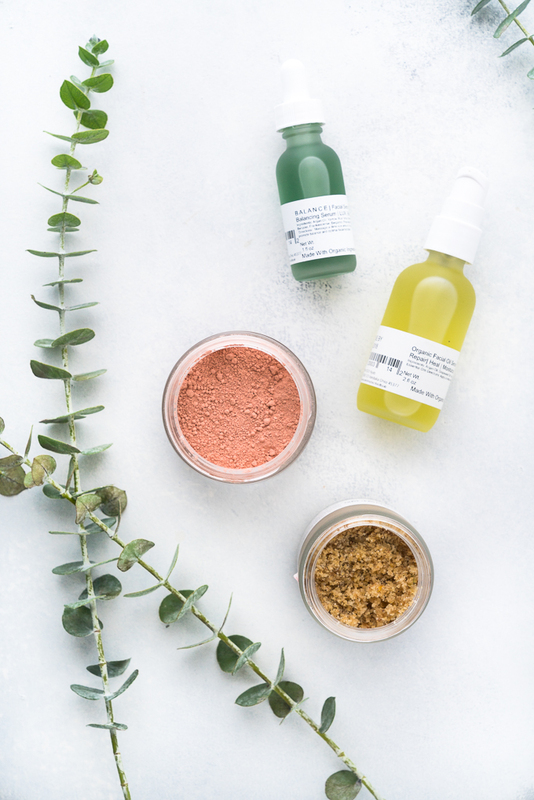 This feature really comes in handy if you use any Indie Green Beauty brands or like purchasing handmade cosmetics from local merchants in your area. As long as you have access to the ingredient list, you can create a report. I like to go directly to the brand website (or wherever it’s available online for purchase) to see if I can copy + paste the ingredients directly into the report generator. Makes it super easy and saves a ton of time. A good rule of thumb that I use is the same one I use when checking food ingredient lists – if I see an ingredient listed that I can’t pronounce or don’t recognize, I look it up. Sometimes a strange looking ingredient name just ends up being a Latin name for a totally safe plant extract. But it never hurts to get curious and question what’s in the products you use frequently. If you find that the product you’re using doesn’t have a stellar score – don’t worry. You can browse entire categories of cosmetics and use the directory to discover new brands. Swapping over to cleaner and greener products does not have to happen overnight (it certainly didn’t for me). I am definitely not asking you to go over to your bathroom counter top and sweep everything straight into the trash. I’m advocating quite the opposite actually! Transforming your product line-up doesn’t have to be an intimidating process. And it doesn’t have to be overly expensive or budget-busting either. 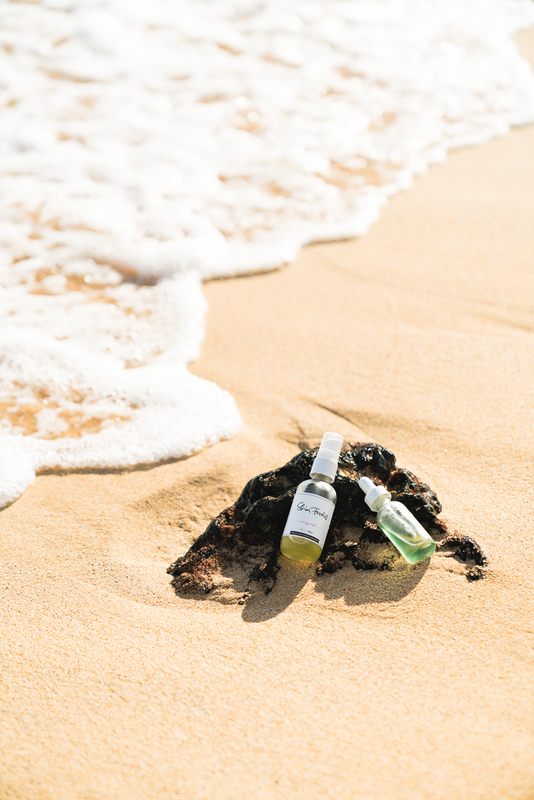 There are plenty of brands to choose from, whether you want something in an economical price point or something more luxurious – just like with conventional cosmetics, there’s something out there for everyone. This is the perfect place to start if you’re feeling overwhelmed but still really want to put what you learned into action & get on the path to detoxing your beauty routine. Narrow down your list – commit to which products you really want swap out. If there’s something you don’t use all that often (like that perfect shade of red lipstick you only wear for date night) then cross it out. Focus on what you use on a consistent basis and have the highest exposure to. Also, if there’s anything you really really love and aren’t willing to live without (like your favorite dry shampoo) cross that one off the list too. You can always come back to these later down the road if you decide you’re ready and willing to change those up too. Prioritize your list – find out what you’re running out of and put those items at the top of the list. Whatever is basically brand new, should stay towards the bottom. You can use up what you’ve got first before trying to replace everything all at once. Choose one product from the list and start looking at cleaner options to replace it with. When you find one that seems promising, buy it or order it online and keep it on hand so when the time comes the switch is easy and effortless. Remember: Try your best to go easy on yourself and be patient while you make these big changes. It’s easy to get frustrated or start to feel guilty about the products you’ve been using since forever that aren’t as clean as you thought they were. Remember, you didn’t know and they didn’t tell you. Feel confident in your decision to make small, manageable, sustainable changes that fit YOUR life and budget. It’s a huge step. And one you should definitely be proud of yourself for taking. Rest easy knowing that you are in the process of creating some pretty major change in your life! Focus on this idea: Celebrating progress over perfection. If your product ranks at a “10” on the EWG scale, choosing anything-better-than-a-10 is progress. Not every product is going to be perfectly clean or thoroughly researched. And that’s okay. Because let’s be real – the most perfect product, the one that is the most “natural” is really…no product at all. It’s leaving your skin and your body bare, the way you came into this world. But beauty and body care products have become such a huge part of living well (not to mention hygienically) – there’s no need to deprive yourself of life’s little joys and comforts. Just like there’s no shame in taking things slow. For example, if you want to take your “8/9” shampoo down to a “5/6” and then move lower down the scale later on – do it!! Small steps can add up to big changes. My challenge to you today is to just start with one single thing. Let that be your starter swap. Make a commitment to yourself (yes, right here and right now!) that you’ll look up its ingredient list. If it turns out to contain ingredients that you’re not super stoked about, consider replacing it with a cleaner + greener choice. The more you use something, the greater the amount of exposure you have to that substance. So if you’re using a moisturizer every day or deodorant every day, and then leaving it on all day– that’s a lot of exposure. But don’t be discouraged – that just means that there’s a LOT of opportunity to make a big difference by changing that one small thing in your life. And that is something to feel super hopeful about! If you have any burning questions or want to share YOUR clean beauty faves, be sure to drop them in the comments below!! I’ve been wanting to make the change but had no idea where to even start. It’s all so overwhelming. Thank you for writing this post and sharing these resources. I felt the SAME way when I was starting to make some changes in my every day products – thanks so much for reading, Shawn! Great post! It’s so important to remember that you don’t need to do a major overhaul immediately. Being able to slowly transition (and not feel bad about it) is so key. Thanks, Dayna!! Cheers to making the best choices that uniquely suit us / our needs, and not feeling pressured into making decisions that don’t feel good. You’re 100% right – having that patience with yourself and your journey is SO important. It feels so easy to get swept up in those perfectionist tendencies, doesn’t it? Wanting everything to be the absolute best as soon as we possibly can. But I totally agree that approaching things slowly is such a kinder and gentler way to go.